What kind of mass transit is the most eco-friendly? Intercity buses. Yup. Most of us don't travel much on intercity buses, and we have reasons for that. Bus routes between cities in the U.S. can be unreasonably long - I think Charlotte to Birmingham takes 1 or 2 days one-way, as I recall from our friend Carra. But other bus routes make a lot of sense. The trip from Charlotte to Asheville NC is only about 3 hours (same as by car), it's cheaper than the gas to drive it yourself, and the bus is remarkably punctual - unlike Amtrak and many airplanes. All in all, buses are not a bad way to go, unless it's a very long route that stops in every burg and holler. Convenient or not, bus travel is green, we have to give it that. Michael Brower and Warren Leon of the Union of Concerned Scientists calculated that intercity bus travel is by far the least polluting mode of personal travel per passenger-mile. Intercity buses are 2 to 4 times less polluting than cars and trucks, per passenger-mile. Intercity buses are also less polluting than passenger trains and air travel, per passenger-mile. You might guess that cars and trucks are the most polluting form of travel. And you'd almost be right. But motorcycles are actually worse. A motorcycle generates the same amount of greenhouse gases as a car, per passenger mile, but twice as much toxic air pollution and 3-4 times as much toxic water pollution. Even though motorcycles get good gas mileage, their small engines have fewer emissions controls than cars. Also, they're made of a higher proportion of steel and other metals than other vehicles, which accounts for their high toxic air and water pollutant emissions. The best way to reduce consumer fuel consumption is obviously to travel less, but that’s hard to do when lots of us live in the suburbs and work downtown. Our local newspaper here in Charlotte often features developers who are planning self-contained and mixed-use communities, which in the future will house workers closer to jobs and services. We need more such housing and we need it now, before we pass one of those infamous "tipping points" on our journey toward climatic upheaval. For now, we could reduce fuel consumption tremendously by making better use of mass transit, especially in cities. Half of the United States' 26 largest urban areas currently fall short of the EPA’s minimum air-quality standards. Increasing ridership on the 35 public transportation systems serving these cities (subways, light rail, intracity buses) would improve air quality, congestion, and the financial strain of building new highways and widening roads. But... municipal dollars won't be funneled into mass transit unless consumers demand it. So let's start demanding. If you live near a functioning mass-transit system, consider using it, even if just one day per week. Every little action helps. Just doing one little thing can inspire you to tell someone else about it, who might then do it themselves, and might tell someone else. Action generates its own momentum. I believe that. Michael Brower and Warren Leon, The Consumer’s Guide to Effective Environmental Choices: Practical Advice from the Union of Concerned Scientists (New York: Three Rivers Press). Last kid graduates: When do we get to stop working? Our second and last kid graduated from college in May. Ken and I are thinking "When do we get to stop working?" We live in a very small house (1415 sq ft), we drive cars that are 13 and 14 years old. I wear clothes from Community Thrift or Goodwill. Ken wears his until they're threadbare. We've socked away more than 20% of our earnings into retirement accounts since we were thirty. And yet, because we've both worked as educators and I as a writer, we have not made enough to have a hefty retirement account yet. Yeah, we could keep working until our mid-sixties. But our friends who have worked in banking or other more lucrative careers are retiring now. It's hard to watch. They get severance packages plus lifetime health coverage, neither of which we will get. We've thought about retiring to Costa Rica, where the average wage is $3,000 per year. In such an economy, we'd be relatively wealthy. But we're not ready to do that, at least not now. We're developing a different kind of plan that involves building a very inexpensive new house, and renting out the house we're in now. While we're renting it, the property will hopefully appreciate. It's in a neighborhood that is pretty close to downtown in a growing city, so that's a fair guess. What kind of inexpensive housing do we want to build? Ken suggested a trailer, but I don't think so. While interviewing green entrepreneurs for our last book (written with daughter Sadie), I met a number of families who have built environmentally friendly and low-cost homes. I keep thinking in particular of Barry Ford of Lancaster SC, featured in our book Going Green. He, his wife, and his young step-son built a 2300 sq ft house for only $13,000 in 1998, which works out to $5.65 per sq ft! They didn't even need a mortgage. I toured it; it's a beautiful home. Ford says it's been appraised above the value of his neighbors' conventional ranch homes. The walls are all made of stacked rows upon rows of bales of straw, covered with stucco. The Fords started by gathering 1000 strawbales, purchased directly from farmers and piled up on the building site. They kept the bales covered with a tarp until they were ready to begin construction. 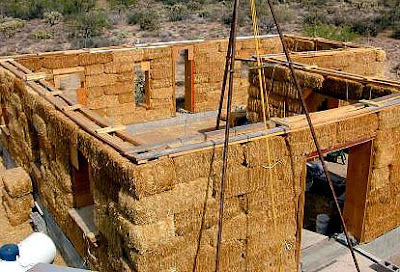 Some strawbale homes are post-and-beam, meaning that the bales of straw are laid between load-bearing vertical posts that are more or less like studs in a stick-built home, although the posts are much farther apart than studs. In post-and-beam construction, the bales serve as both insulation and as a substrate for the stucco or plaster surfacing. But in the Ford home, the strawbales are load-bearing. There are no posts and beams. The Fords didn't even use rebar, which many strawbale builders run vertically from the concrete foundation upward through the bales to stabilize them. The engineers at Cornell and Clemson who served as consultants to the Fords advised against rebar, because the penetration by the rebar (threaded steel rods) allows moisture to get inside the bales. The Fords built their home, one bale at a time, over a period of 10 months, while they were both working at full time jobs. They worked on the house evenings and weekends. The only labor they hired was for one or two days while framing the roof. Or we might build a paper-bale home. Our publisher turned us on to a couple in Colorado who built one. They used bales of post-consumer paperboard and PVC trash. These materials - glossy coated cardboard (like laundry soap boxes) and waste plastic (old toys, laundry baskets, shampoo bottles) – are hard to recycle and usually end up in landfills. For this Colorado couple, the paper-bale walls give their home an insulation value of R-30, far beyond the energy-efficiency of most conventional homes. Ken and I like the fact that both strawbale and paper bale construction use waste materials. (Straw is hay that has had the edible seeds removed.) Making use of waste would feel good both environmentally and financially. We might build an earthship home, like our friends Carol and Neil are doing. It is sort of the ultimate in sustainable builidng and sustainable living. The walls are made of old tires, which Neil and Carol are collecting now. The home has passive solar design to save on heating and cooling costs, and it has a water recycling system that reduces the home's need for well-water or city water to almost nothing. Then there's Trip Overholt of Chapel Hill. He moves older houses that are slated for demolition because of land-development plans. He hauls them to a new foundation on a vacant lot, and then sells them for a lot less than a custom home would cost. That's the ultimate in recycling, because it keeps the older house out of the waste stream, plus it avoids all the new materials and energy required for new-home construction. A lot of exciting options! At one time I wanted a bigger house so I could have a home office and a guest room and a den and a dining room, none of which we have now. (We do have 3 bedrooms.) Now, I just want a cheap house. A really cheap and energy-efficient house. I'm optimistic that we can be economical and green at the same time. I'm eager to get started. But where should we build? That's the first question. All the people and homes mention in this post are described in detail in Going Green, available on amazon. Before too long, our most direct link to global warming will be the food on our dinner tables. The vast bounty of our neighborhood supermarkets all depends on cycles of rain and air temperatures in far-off parts of the globe. Now, across the world, those cycles are changing and the effects will be profound — for all of us. As patterns of wind and rain shift, no one knows exactly where the water will end up or when it will arrive. But most of the big computer models predicting Earth's future climate, including those created by NASA's Goddard Institute for Space Studies, foresee declining rainfall in the tropics. Harvests in those regions will decrease too. In India and much of Africa, already struggling with food shortages, food production will drop. Climate change will produce more extreme weather, such as hurricanes and monsoons that can destroy crops and leave people with no food at all. Most scientists don't foresee major changes in total food production during the next decade or two, as average temperatures increase by just a few degrees. As food production falls in sub-Saharan Africa and India, food production will actually increase (temporarily) in temperate regions such as North America and Europe. As a result, the world will become increasingly dependent on a handful of major food exporters, such as the United States, Canada, Australia, Brazil and Argentina. Forty or 50 years from now, as today's children reach middle age, things are projected to get worse. As temperatures continue to rise, along with levels of greenhouse gases in the atmosphere, most models show global food production falling. The areas most affected will be those least able to purchase food from abroad. Foremost among these is Africa. According to some estimates, tens of millions of people could go hungry unless there's a major effort to help these countries adapt. Agricultural communities can adapt in some ways, but it won't be easy, especially in the poorest parts of the world. The soil in many parts of Africa is highly degraded from overgrazing and overharvesting. 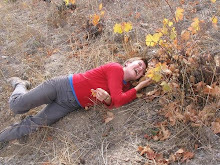 There's very little organic matter — decomposed leaves, roots and grass — left in the soil. It isn't replenished because any leftover vegetation is used for fuel. Improving the soil would help Africa prepare for climate change by increasing harvests and also helping the soil store water. Providing alternative fuels for rural households is one way to help improve soil in sub-Saharan Africa. Anything that increases the wealth of developing nations, especially in the tropics, will help them adapt to coming food shortages. What can we do? Decrease our own contribution to greenhouse gases, with our driving choices, our food choices, and how we heat and cool our homes. Our new book Going Green: A Wise Consumer's Guide to a Shrinking Planet offers guidelines for these three high-impact consumer categories. Our new book is out, as of May 2008. 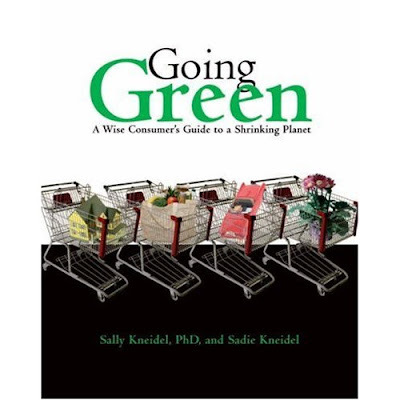 It's Going Green: A Wise Consumer's Guide to a Shrinking Planet. 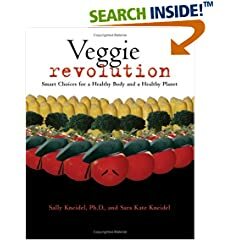 While Sadie and I were researching our first book together, Veggie Revolution (2005), we learned so much about the environmental and health impacts of the food industry. It profoundly changed my life, and I think Sadie's too. One thing we learned is that the food industry is completely consumer driven. In Going Green, we looked farther afield to see how we as consumers fund other environmentally-damaging industries. We also took a closer look at the dark underbelly of food production, and in the new book we report some startling interviews. Before these books, we had often debated whether our own lifestyle choices - our diet and other purchases - were really making a difference. So we took the time to find out. We wanted to help busy consumers make informed choices about the products they buy without sacrificing their comfort or way of life. Specifically, Going Green guides consumers in the most effective and economical ways to reduce their ecological footprint and greenhouse gas emissions, especially in the highest-impact categories of food, transportation, and how we heat and cool our homes. We included clothing too, because readers ask about that. 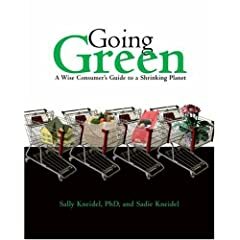 For example, the book reviews the different kinds of “green” cars, from hybrids to flex-fuel cars to diesel cars equipped to run on pure vegetable oil. For a reader interested in “green” clothing, the book compares the environmental and health effects of organic vs. non-organic cotton, bamboo and hemp fabrics, synthetics, wool, as well as second-hand clothes. We cover dyes and finishes too, which vary widely in their toxicity. Want to reduce your home energy bills? In Going Green, we report on the greenest (and cheapest) choices for new home construction, such as passive solar design and building with waste materials. But the book is loaded with information about reducing energy consumption in an existing home by sealing leaky doors and windows, buying Energy Star appliances, or simply changing your light bulbs. It’s a very practical book with a positive outlook. Why is this book timely? There is an explosion of interest right now in eco-friendly lifestyle choices. That interest is driven by the escalating cost of fossil fuels for transportation and for heating homes. It’s also driven by scientific reports published in the past year about global climate change, and the urgency of taking action to slow it right now before we pass certain “tipping points.” This is a book to guide conscientious citizens in taking action. None of us make perfect choices across the board, we’re all human. But if everyone does something, the effects add up. Ricky's and my struggle to begin our microfarm was proving difficult at every turn. No materials. No space. No money. Somehow we'd managed to plow our field, make our potting mix... and now, finally, on a cool February evening, we filled nine 128-cell flats with seed. Dwarf Thumbelina Zinnias… Blue Scotch Kale… the names brimmed with promise. As I swept off the porch, Ricky went off in search of the watering can. She came back, lugging it full of rainwater. Gingerly, she tipped it forward to water the first tender tray. Immediately, the spray-end fell to the ground, blasting a few cells of dirt with an undiffused jet stream of water. She looked at me reproachfully. “It’s broken!” she said in a tone of surprise. That night we watered the trays with mason jars. That worked until the dirt formed a hard crust from having thick layers of water poured over it. Then it was time to upgrade to a drugstore watering can for $1.29. In addition to gentle watering, seedlings need steady, constant temperature and light. I kept remembering the farm I’d worked on: the warm, humid greenhouses with their automatic watering systems and gently humming fans. How could I replicate that here? In the back yard, we have a small hoop house that one of my housemates built out of a pallet and some scrap plastic. It does a great job of converting lukewarm spring sunshine into steamy heat – at least while the sun’s out. But I wasn’t confident it would protect delicate seedlings at night, or when the temperature got below freezing. Meanwhile, Ricky was in the process of moving into a house under construction. All her possessions were in boxes; her house was full of tools and sheetrock dust. She couldn’t take the seed trays. No, it was up to me. I prowled through the house with an appraising gaze. South facing windows… wait, that just might work! I ran to the kitchen for an armful of plastic shopping bags and old newspapers. Then to my bedroom. Clearing off my desk, nightstand, and dresser – all within reach of the south-facing windows’ light – I spread out bags and covered them with a thick layer of newspaper. With a little rearranging, I fit five trays on my dresser, three on my desk, and one on my nightstand. I didn’t really need my lamp. My alarm clock could go on the floor. Perfect! Well. Maybe not perfect, but functional at least. Hopefully. Would anything grow? But Phil Goff, New Zealand's trade minister, told an Organisation for Economic Co-Operation and Development (OECD) in Paris yesterday that a solution was in sight. The 45 million sheep and 10 million cattle in New Zealand burped and farted about 90 percent of that country's methane emissions, according to government figures. In comparison, livestock are responsible for about two per cent of the United States's greenhouse gas emissions, according to the US Environmental Protection Agency. 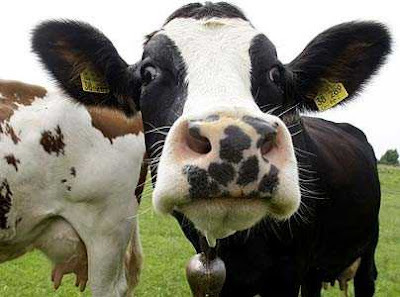 In the past New Zealand's farmers have showed their disgust at government plans to impose an animal "flatulence tax" by sending parcels of manure to members of parliament.